A proactive approach to highlighting road safety when parking is been taken in one west of Ireland town where cartoon signs are being deployed in Westport in to highlight inappropriate parking. Mayo County Council are using a range of eye-catching signs to help address the problem of unsafe parking and driving in and around school entrances, the first time these signs are been used in Ireland. The signs are double sided so they are visible from both directions of traffic. 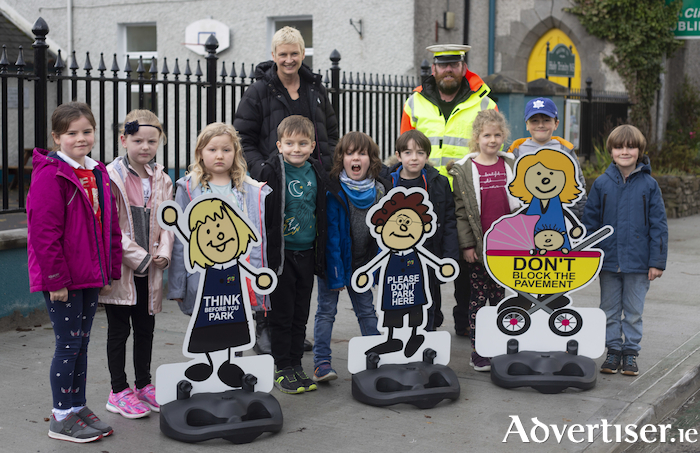 The new initiative, is designed to raise awareness of the serious problems that obstructive parking and congestion are causing on a daily basis in reducing visibility for children and elderly when they are crossing the road or trying to navigate around parked vehicles. Many urban suffer from the problem of thoughtless drivers who opt to use restricted zones when dropping off and collecting children. Mayo County Council wants to cut these accident rates by stopping vehicles from parking on keep clear signs, zig-zag markings, footpaths and other illegal places that create ‘danger spots’ for young people and other pedestrians. Noel Gibbons Road Safety Officer Mayo County Council stated: "Many road users are been put in danger with such parking problems and we’re asking motorists to be more mindful when parking even for a short period of time. "These set down areas are outside our schools for a very good reason. They’re there to keep pupils safe by creating a sight line that enables them to see and be seen before crossing the road. "The majority of drivers do take notice of these markings and behave responsibly – but there is also a minority who ignore these restrictions for their own convenience. "These people continue to use restricted zones when dropping off and collecting children just to save themselves what amounts to seconds of their time. Road Safety signs have been designed to be set out each morning and afternoon to raise awareness of the dangers to pupils from drivers. Garda Sergeant, James W. Malone from the divisional Traffic Corps, Castlebar added: "It’s a pretty simple message that motorists need to understand here. Parked vehicles in these areas can mask children trying to cross the road and we have to do something about it. "If you’re not breaking the rules then you have nothing to worry about. But if you are, we will make no apologies for taking direct action to potentially save lives." Page generated in 0.1235 seconds.